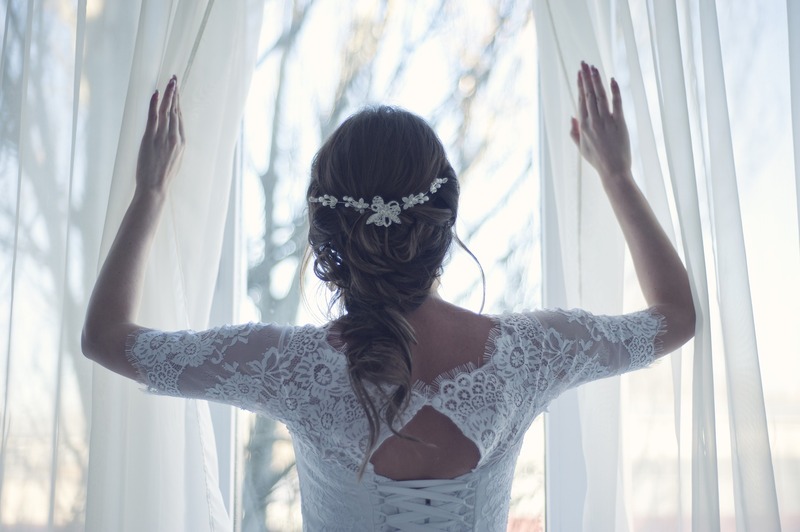 If you are planning you upcoming nuptials, you sure to be excited to the best day of your life. 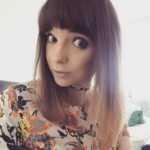 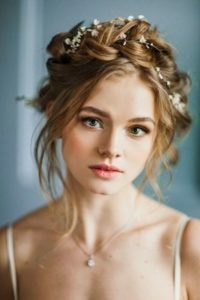 However, we know it can be a nerve-wracking experience too and that you will feel a lot more confident when you are feeling at your most beautiful. 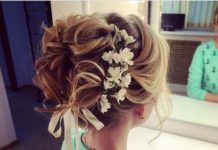 Hair and makeup are a such a big part of a wedding day as every bride deserves to feel a million dollars. A braided wedding hairstyle is such a popular choice as they generally hold in place well all day, and there is so much versatility with gorgeous styles for both long and short hair. 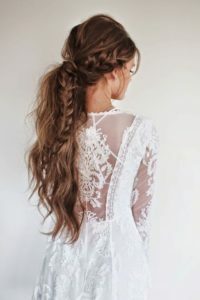 So, if you are thinking about how you will be styling your hair on your big day, get some inspiration from our favourite braided wedding hairstyles. 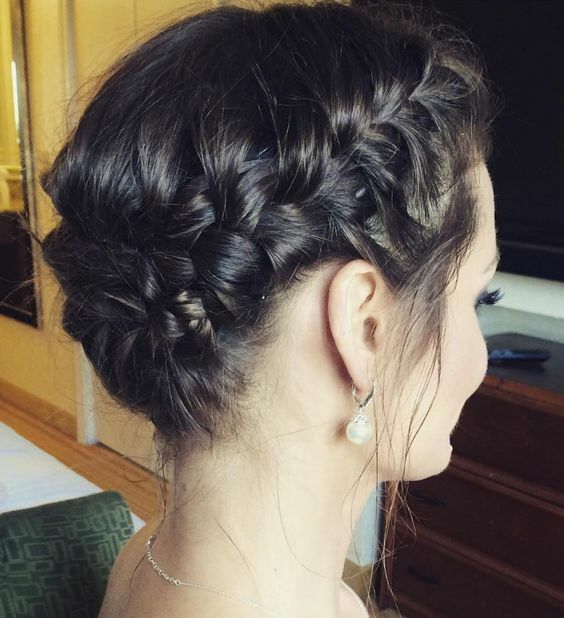 There is no rule to say that bridal hairstyles need to be polished and sleek. 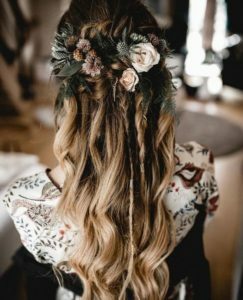 This loose and tousled braid has such a wonderful Bohemian vibe, which has been added to with the addition of real ivy flowers…gorgeous! 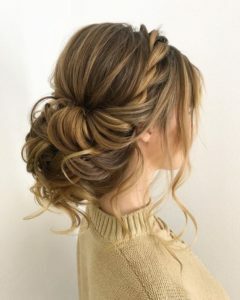 Giving a wave to this hair before securing into a low bun has given the style great body and movement. 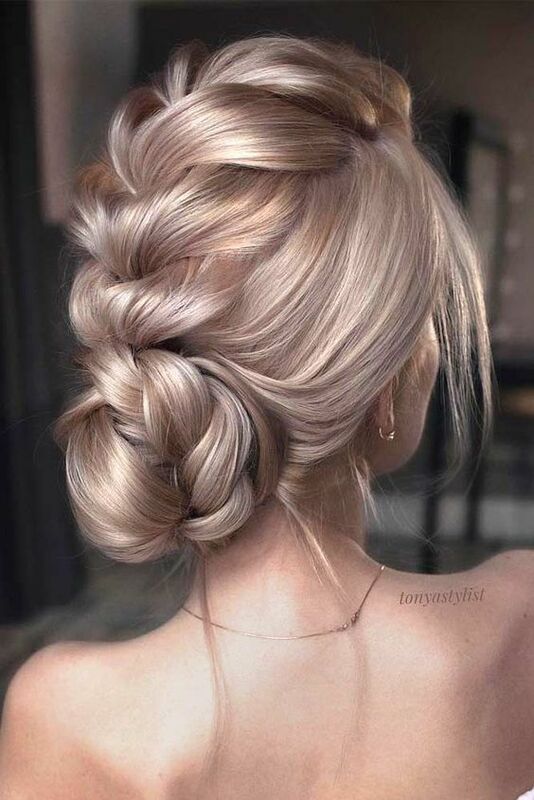 Loving the fed-in braid and the loose tendrils that frame the face. 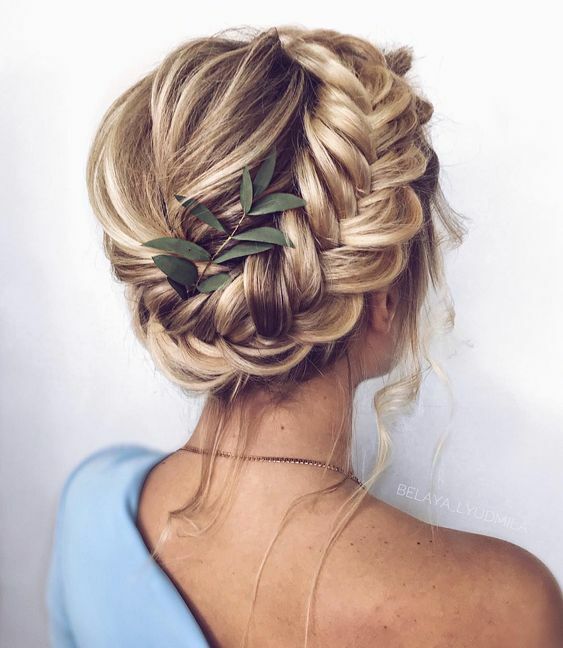 An elegant high bun is a great wedding hairstyle and this one has been taken to the next level with the addition of a four strand braid that has been wrapped around it. So effortlessly chic! 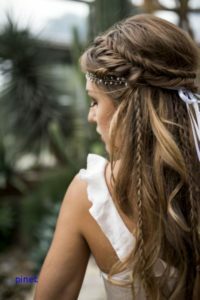 For a free-spirited wedding hairstyle plait different sized sections of hair into different types of braids. The half fishtail braid crown is stunning and the little French braids peeking out of big bouncy waves are lovely. This is a really lovely wedding hairstyle for shorter hair. In inverted bob has been given a bouncy curl that adds volume that is complemented by a side braid. 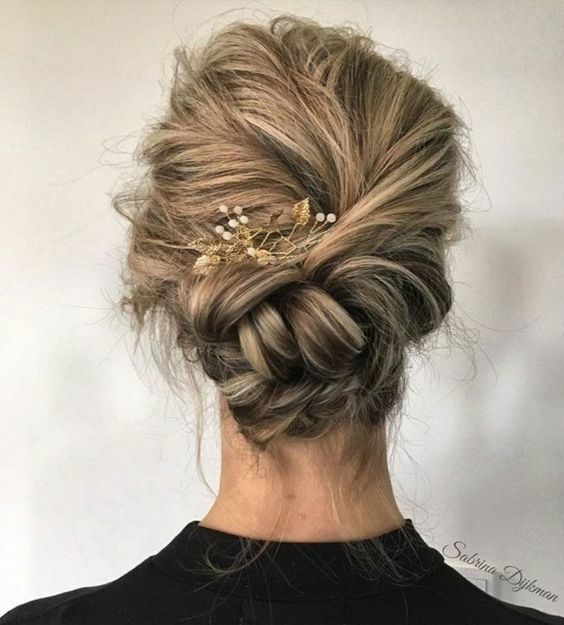 The little floral pins are subtle and chic. 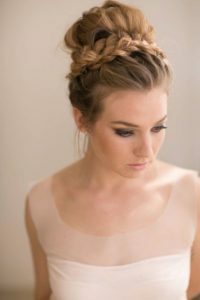 This braided chignon is a gorgeous bridal hairstyle. 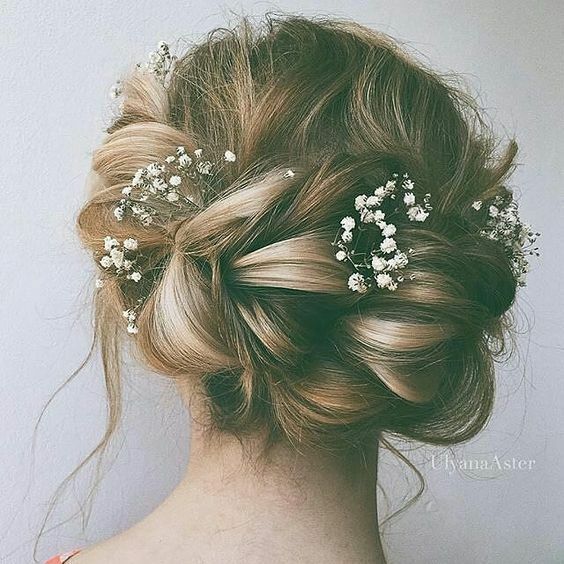 The chunky braid is light and airy and the ladies’ breath flowers are so appropriate for a wedding day. 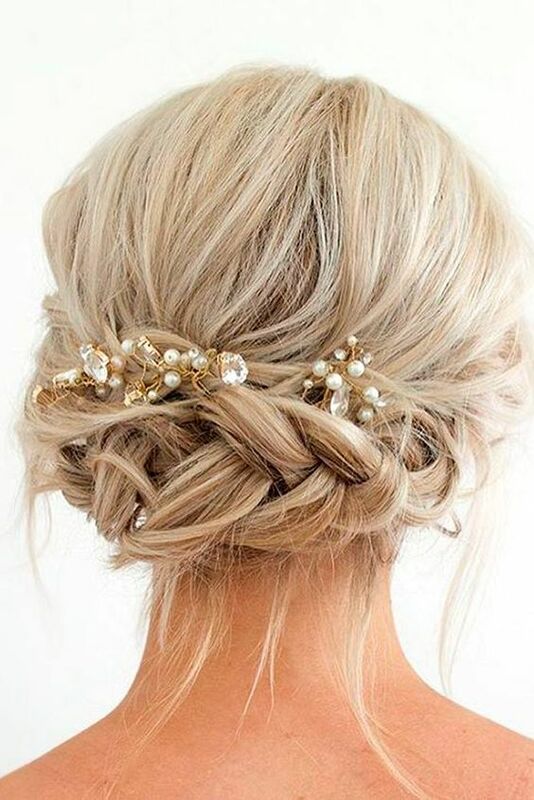 This lovely bridal braid is so romantic. The strands of the braid have been teased out to add some extra body (a great tip for fine hair) and the flowers woven into the plait look so elegant. There are so many different ways to wear halo braid and these side-swept waves are such a beautiful variation. Definitely one of the more unique bridal braided up-dos. 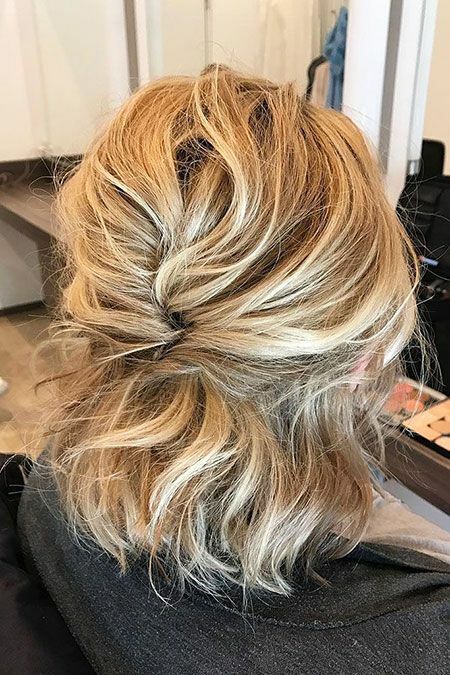 Short and mid-length hair looks gorgeous with a braided half up-do and has the added bonus of not having to hope the style stays put all day. 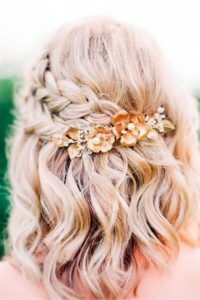 These two lovely French braids have been pinned in place with a sweet floral accessory and those hair styled into piecey waves. 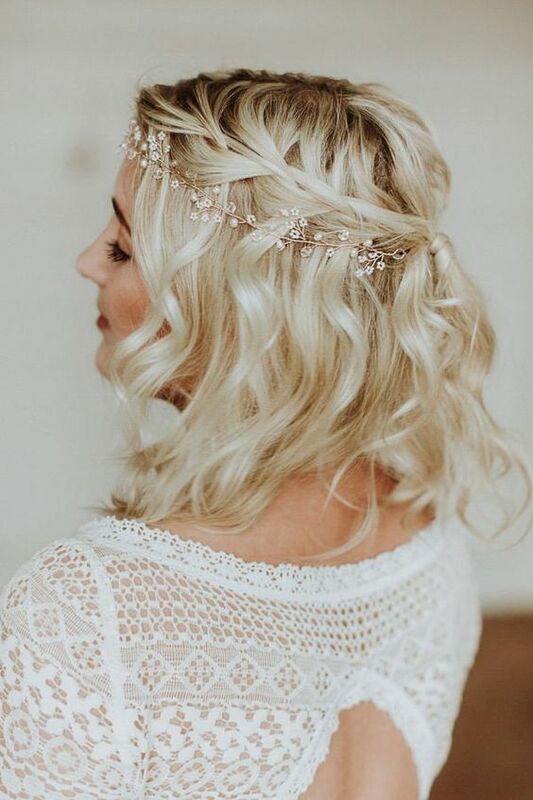 There is something so whimsical about these multiple French and rope braids that are all secured at the nape of the neck with a gorgeous and subtle floral hair accessory. 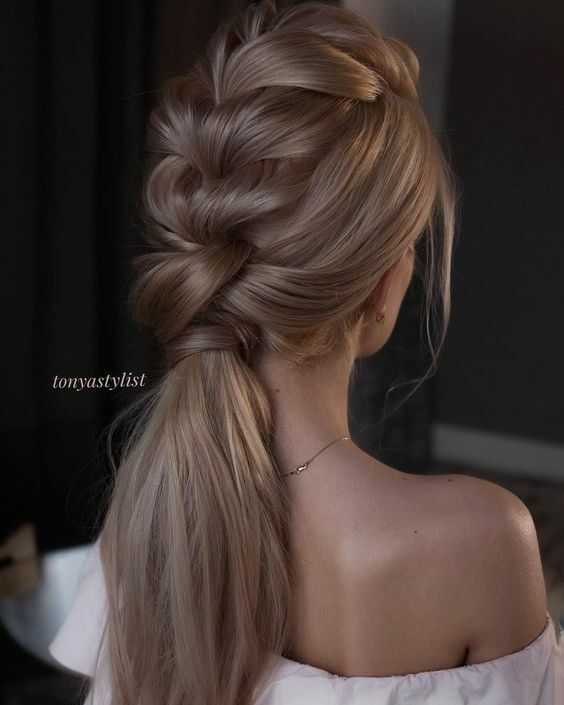 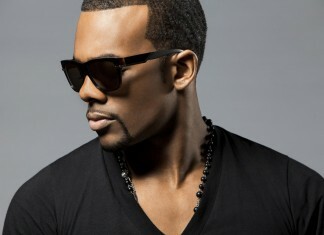 The long sleek lengths are beautiful and the pompadour bangs are a great finishing touch. 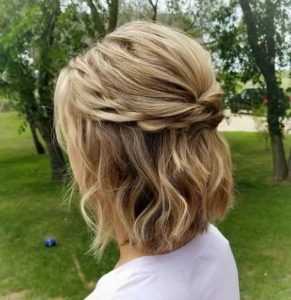 The wrap around Dutch braid is such a simple style that has such a big impact. 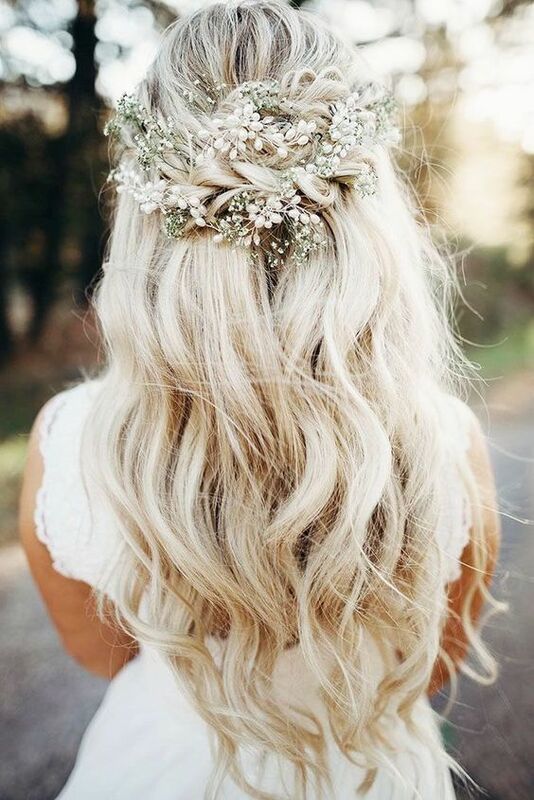 The loose tendrils and leaf accessory give the hairstyle a fairy tale vibe, don’t you think? There is so much to love about this bridal style – the fishtail braid, the icy blonde hue, the matte texture and the floral decoration. Idea for a beach wedding. 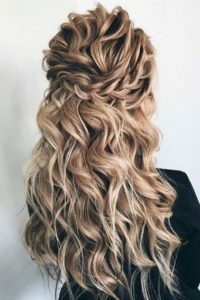 Thick honey highlights in this golden brown lob have been emphasised with a chunky halo braid and soft curls. Loving the delicate floral accessories too. 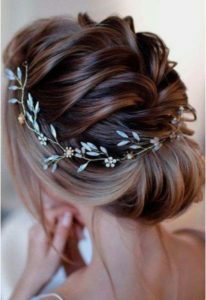 Polished perfection – this chic bridal hairstyle features a neat floral headband that meets at the nape of the neck in an elegant chignon. This is such a great braided bridal style for those with long hair. 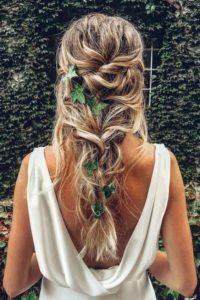 The long ponytail has lovely texture and the Dutch braid that is fed into adds an extra little detail, and a place to hold flower or jewelled accessories if you wish. 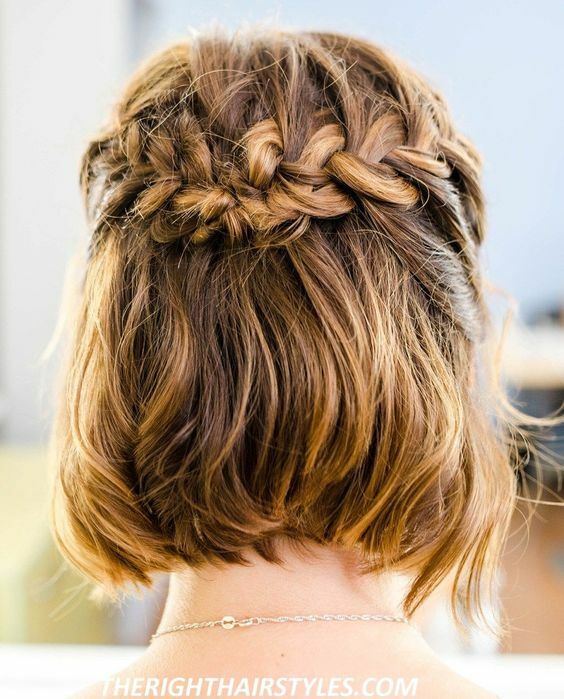 This hairstyle shows how to perfectly incorporate braids into shorter hair. 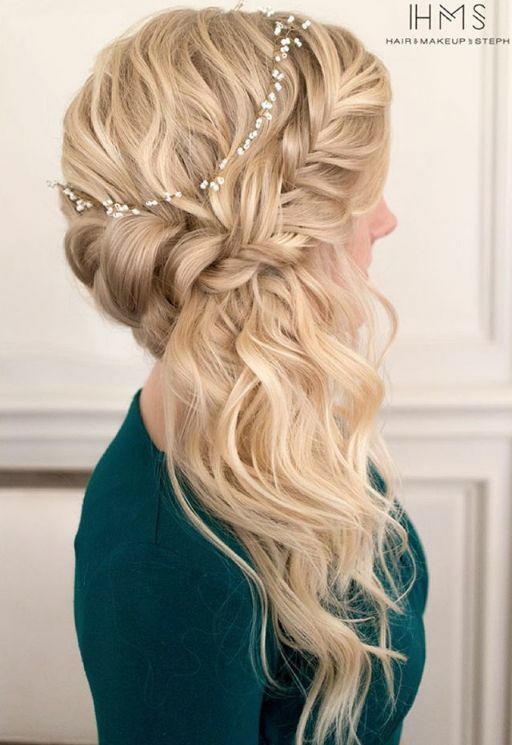 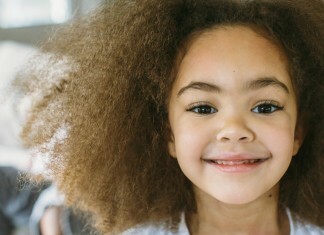 The natural texture of the hair is stunning and it has been accentuated by a lovely half French braided crown. The braid really shows off the gorgeous warm tones of the hair. 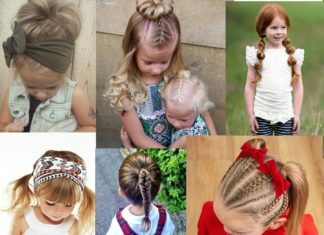 As you can see there is so much versatility when it comes to braided hair. 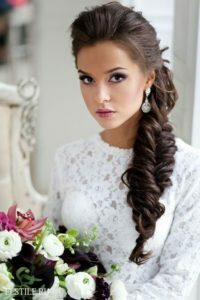 A braided wedding hairstyle can be carefree and effortless, chic and polished, or Bohemian and relaxed. 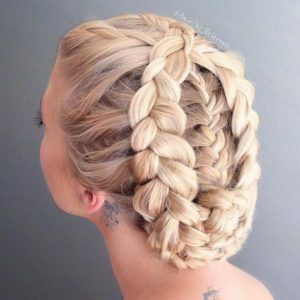 Furthermore, there is a way to incorporate braids into any length of hair from the short to the super long, plus plait work in both finer and thicker hair types. 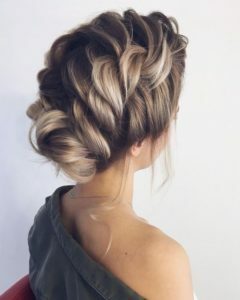 Finally, braids also look good in complete up-dos, half up-dos, or just as a little detail in an existing style. 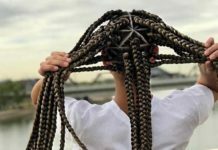 There really is so much you can do with braids. The versatility is not the only great thing about a braid as a bridal hairstyle. 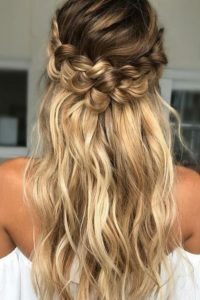 Most braids have great staying power, holding their style all day when secured with a few invisible grips and a light spritz of hairspray. 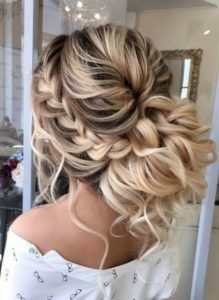 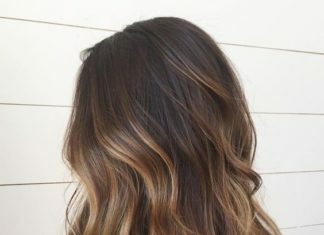 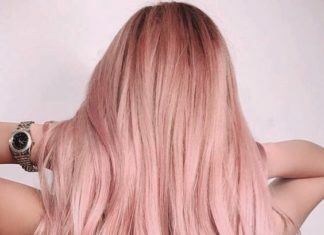 You won’t have to worry about how your hair will look in pictures – if a few tendrils escape, it will just add to the charm of your style. 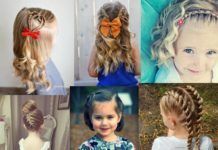 There are so many different styles of braid – from the simple rope braid to the intricate five-strand braid, from the classic French braid to the contemporary pull through braid. The best way to find the right braid for you is to book yourself in with your wedding hairstylist for a few sessions before the big day to experiment with a few different looks. 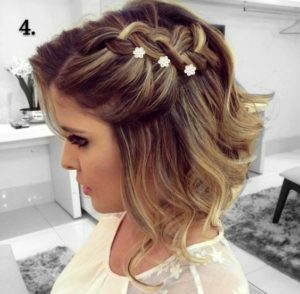 This way you know the braided wedding hairstyle you have chosen will be perfect.